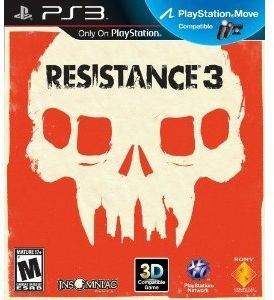 Resistance 3 is the 2011 release in Sony's flagship Resistance First-Person Shooter game franchise for play exclusively on PlayStation 3. Picking up right where Resistance 2 left off, players follow the adventures of Joseph Capelli -- introduced in the previous game -- in a desperate effort to turn the tide against the ever-strengthening Chimeran horde. Features include: PlayStation Move support, a large and strategic weapons arsenal, smarter and more agile Chimeran enemies and deep multiplayer options including co-op online and offline as well as progression based 16-player online multiplayer.